The blue line shows the trend line that was solidly broken but the ETF has closed decisively above it today. The horizontal red line is the first resistance line. 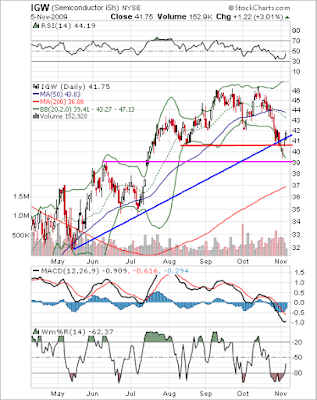 IGW closed above this level today, also. Williams %R shows the ETF is just now moving out of an over-sold state. It should have room to run. The 200-day moving average never wavered. It is still moving solidly upward. After a 15% drop from its peak, this ETF certainly endured more than a correction. Seeing the range of the Bollinger Bands and the slope of the 200-DMA, however, I'll go out on a limb and predict that IGW should be able to achieve a 12% to 20% gain before the next serious pullback. So sometimes a sector never quite reaches bargain levels but when it's making a bullish move, perhaps that's not so important.